The POSIX subsystem in Windows is headed for a slow death march, again. Not many people realize that Windows NT had a POSIX subsystem from the beginning which was enriched along the way to run a fork of OpenBSD called Interix. Originally the POSIX subsystem was bundled with Windows NT 3.1 and was a barely useful POSIX.1 environment to meet DoD purchasing requirements. 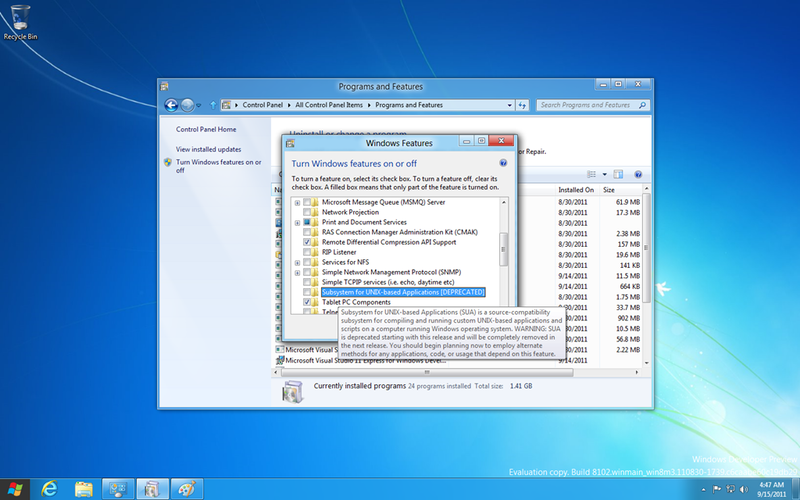 Later, it was removed from the Windows core distribution, re-implemented by an ISV and called OpenNT and then Interix. Interix was acquired by Microsoft and sold for a while before being distributed free of charge. Later it was bundled with Services for UNIX 3.0 and 3.5 before being re-integrated into the Windows distribution as the Subsystem for UNIX-based Applications (SUA). At one time Interix actually ran Hotmail during the migration from a FreeBSD to NT backend. After passing back to the Windows team and being rebranded SUA, Interix languished. The original developers scattered to other projects like Monad/PowerShell, left Microsoft or were never hired by Microsoft when it acquired the technology in the first place. Interix is maintained by a very small team at Microsoft India and these guys are focused primarily on just keeping it working through kernel updates. In practice, the quality of the product has been in decline. At one point, for example, it shipped with most of the .so shared libraries corrupt so that nothing that linked to those libraries would run. The toolkit that makes SUA useful lags many, many months behind the release of a new version of Windows and Microsoft required “premium” client SKUs (ultimate or enterprise) or server SKUs to access the technology which greatly limited its distribution. It is generally as unloved by the powers that be as anything could be, except perhaps IronPython and IronRuby which have already been killed. Subsystem for UNIX-based Applications (SUA) is a source-compatibility subsystem for compiling and running custom UNIX-based applications and scripts on a computer running Windows operating system. WARNING: SUA is deprecated starting with this release and will be completely removed from the next release. You should begin planning now to employ alternate methods for any applications, code, or usage that depends on this feature. One obvious reason to deprecate SUA is that loading the extra subsystem makes Windows take a noticeably longer time to boot. The architecture is very much at odds with the instant boot goals of Windows 8. There have been a number of developments over the last few years that makes Interix less compelling. Things like fast-CGI on IIS and an official PHP port from Zend, lots of dynamic languages with native Windows runtimes, mySQL and PostgreSQL for WIndows, C libraries like pthreads for win32 and msys which have made Interix less necessary. For perl-heads there is even Strawberry Perl which is supposed to be a lot more CPAN friendly than ActiveState perl. I think Hyper-V and PowerShell are the real strategic replacements for SUA, though. PowerShell integrates with COM and WMI and fits the object nature of Windows better than any POSIX shell could. Hyper-V lets you actually run your UNIX app on Windows on a supported Linux platform which I’m sure smells much less MacGuyver to CIOs than this weird Interix POSIX on Windows thing that nobody ever heard of. From the time that Hyper-V officially supported RHEL with hast enlightened drivers and Jeffrey Snover decided that the new shell and automation for Windows would be based on .NET and pivoted to build Monad/PowerShell rather than putting KSH on every Windows machine, Interix’s days were numbered. Now it’s official, Interix will be gone from the world about 11 years when Windows 8 reaches end-of-life but if you are smart you will jump ship now because this product will have the minimum life support staff imaginable.